Thousands of Ahwazi people have gathered once again on 14th, 15th and 16th of February in front of Ahwaz Governorate office in Ahwaz’s capital demanding swift actions to cope with the dust storm that is currently crippling the lives of the Ahwazi people. Ahwazi protesters, donning face masks, angrily shouted critical slogans against the lack of appropriate actions than those expected to be taken by local authorities to alleviate the suffering of the Ahwazi people as a result of the persistence of the dust storms. The Iranian occupation security forces, by taking tight precautionary measures, scattered and arrested key protesters in yesterday’s demonstration. The occupying security forces, in efforts to quell the public anger of Ahwazi Arab protesters, have tactically and brutally beaten up and handcuffed a group of Arab protesters who played important roles in organizing the peaceful protest. The aggressive operations of police security forces in dealing with the protest resulted in the arrest of dozens of key activists and organizers who were kicked and punched savagely and taken to an unknown place by the occupying forces. The security forces the put up massive barricades to prevent protesters from advancing to other locations. The mass arrests were carried out immediately, just thirty minutes from the start of the protest while protesters raised banners and began chanting slogans condemning the criminal policies of the occupation government. The occupying authorities, to clamp down on the protests, deployed significant anti-riot squad forces to battle the Ahwazi Arab activists who called people to take part in this protest through social Media. Since early February, the Ahwazi people’s lives have been gravely disrupted due to the lingering intensive dust storms causing breathing disorders. Asthmatic attacks have become very problematic and prevalent among the people. The protesters, by holding up numerous placards, placed the entire responsibility of the environmental disaster in Al-Ahwaz on the occupying Iranian central government’s policies in constructing excessive dams on Ahwazi Rivers diverting the course of the water of the rivers to the central plateau of Iran. According to reports and studies led by Ahwazi medical research centers, Al-Ahwaz has become one of the most dangerous regions in terms of air and water pollution. As the annual review of the medical centers indicates, annually more than 22,000 Ahwazi citizens were admitted to hospitals and clinics due to diseases linked to inhaling polluted air or drinking contaminated water. Through the protest which included adults and children, people expressed their outrage at the negligence and the aggressive policies of occupying Persian authorities as they raised banners that read “we have right to breathe clean air”, “you have stolen Oil, Gas, and water and left the dust for us”. The World Health Organization since 2011 has repeatedly rated Al-Ahwaz as the world’s most polluted region. Not surprisingly, cancer and respiratory illnesses are on the rise among desperate poor Ahwazi Arab people. Annually, nearly 2000 people in the Al-Ahwaz area are diagnosed with cancer. A number is likely to increase by 90% by 2020, according to cancer research in Ahwazi medical centers. The WHO says Ahwaz has the highest measured level of airborne particles small enough to cause serious health problems for humans. Despite the severe degradation of Ahwaz’s climate, the Iranian government has done nothing to effectively counter the spreading desertification that is encroaching on the most Ahwazi fertile agricultural lands, transforming them into arid and barren lands as a consequence of lack of water where the water of Ahwazi Rivers due to the diversion into Persian regions. Several of participants in the rally expressed their resentment of what they described as shameful disregard and deliberate neglect by the Occupation state of Iran toward the lives of Ahwazi citizens as the occupying authorities only visit Ahwaz without providing any tangible solutions to combat the environmental and health disasters that are ravaging the lives of millions of Ahwazi citizens. Ahwazi officials continuously stated that the level of dust particles in the Ahwazi atmosphere has seen no signs of improvement and exceeds the acceptable level by 66 times. The Ahwazi protesters placed the responsibility for the devastating consequences of air pollution that pummel embattled Ahwazi citizens on the Iranian occupying government and blamed the Occupation’s pernicious policies at all levels in Al-Ahwaz. The protesters, by chanting fiery slogans have slammed the government authorities for being irresponsible, indifferent as nothing can justify the inactions of the authorities. The protesters reiterated to continue their protest until the authorities take the necessary and essential procedures to tackle this adverse problem is crippling the lives of Ahwazis as the dense dust storm has reduced the visibility to less than 150 meters during the day. The protests continued and escalated in recent days as residents gathered several times in front of the governorate in the Ahwaz capital as an expression of objection and discontentment regarding their neglected fundamental rights. The residents have shown their anger and intolerance of the continued racial oppression and the systematic discrimination that has been practiced against them for decades at the hands of occupying officials and demanded comprehensive and rapid solutions to address the catastrophe of the dust storms have been sweeping through the entire Ahwazi cities for two weeks. No report has been released on the number of Ahwazis who were admitted to hospitals or clinics after being affected by the dust storm. However, many reports with pictures by Ahwazi activists have been circulated via social Medias showing the massive numbers of Ahwazi Arab people who have been hospitalized in the medical centers in several Ahwazis cities due to the dust storm. It is crucial to mention that the United Nations Environmental program (UNEP) said the dust storm in Al-Ahwaz is mainly originating from the dried wetland of Hur-Al-Azim in the west of Ahwaz. 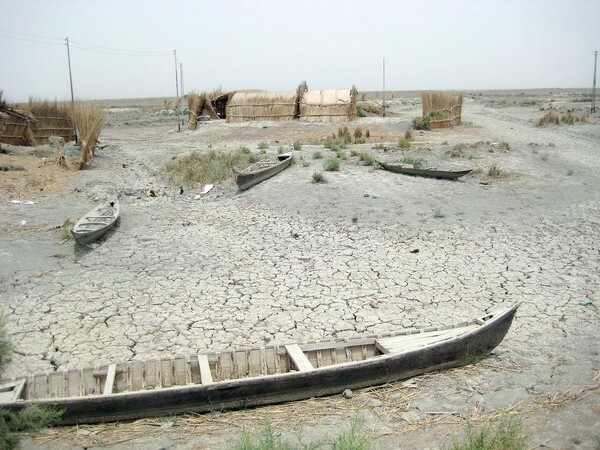 UNEP has already warned Iran about the catastrophic consequences of the dryness of the Hur-Al-Azim wetland. 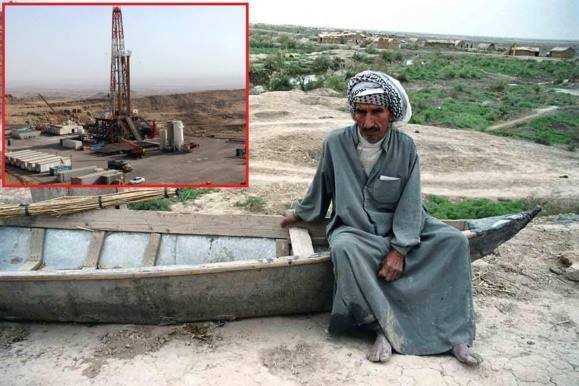 During the Iran-Iraq war (1980-1988) a large part of Al-Azim wetland was destroyed and the remaining part of it was devastated completely with prospecting and drilling of the Azadegan oilfield project, as well as the construction of the Karkheh Dam, which brought about the desertification of the wetland which was regarded as the only economic source of the local Ahwazi people, forcing the majority of them to migrate to surrounding cities. The area of Al-Azim in Al-Ahwaz measures about 3,500 square kilometers but it has been totally dried out by the Iranian oil companies. In recent years, dust storms have jeopardized the Ahwazi people’s health as the level of dust particles ultimately had reached 2,335 micrograms per cubic meter in the February of 2015. The dust storm phenomenon in Al-Ahwaz led to numerous respiratory problems, asthmatic attacks, and even surge in various cancerous and chronic diseases. The plundering policies of Iranian occupiers led to the dryness Al-Azim and Howeyzeh wetlands, the most extensive wetlands in Middle East. The destruction of the wetlands has driven massive population of inhabitants to abandon their lands and migrate to cities. All of these factors combined have caused the majority of them to face homelessness and destitution as they are living in ghettos under the worst economic pressures. Ahwaz is occupied Arab land that is located in the South- West and South of Iran. The name of Al-Ahwaz has changed to Khuzestan, Bushehr and Hormozgan in 1935 after invading the Emirate of Al-Ahwaz in 1925. The Iranian regimes of Pahlavi and Islamic republic deployed different ways to suppress Ahwazi voices. Are you Progressive Except for Syria? Take the handy test here!